We are a comprehensive resource centre connecting people with one another to collectively develop strategic vision & learn skills necessary to impact our multicultural communities. As there are an abundance of resource websites available, we have collectively gathered specific services geared to impact these multicultural communities. You can find these below as well as links to other websites and resources. Input your address at the City of Toronto’s Neighbourhood List to find more information about your neighbourhood, or visit Wellbeing Toronto to search and access statistical data on the GTA. Below is a map of Toronto’s neighbourhoods developed by the City of Toronto. The City of Toronto website has a Portal for immigrants planning to settle in the city, connecting them to most of the services they will need to access. They also have a companion site called Toronto Newcomer Initiative. Settlement.org – is also a great site to find local community services in Toronto – or any other city in Ontario. Resources for specific ethnic groups can be found by going to our Cultural Communities page. Newcomers Canada Fair – Toronto will connect you with government immigration officials, employers, recruiters, English language supporters and more. Other sites provide services for immigrants on a more local scale, such as West Toronto Local Immigration Partnership and for specific language and ethnic groups (like Afghani, Arab, Vietnamese, or Jewish people). Interactive map and regions list – Click on one of the regions to find more resources for each of the communities of that region. Just east of the city of Toronto, Durham Region consists of towns such as Pickering, Ajax, Whitby, Oshawa, Uxbridge, Brock, Scugog and Clarington. Just north of the city of Toronto, York Region consists of towns such as Vaughan, Richmond Hill, Markham, Aurora, Whitchurch-Stouffville, King, Newmarket, East Gwillimbury and Georgina. Toronto is made up of 44 Wards each with distinct cultural identities and communities. Just west of the city of Toronto, Peel Region consists of towns such as Caledon, Brampton and Mississauga. 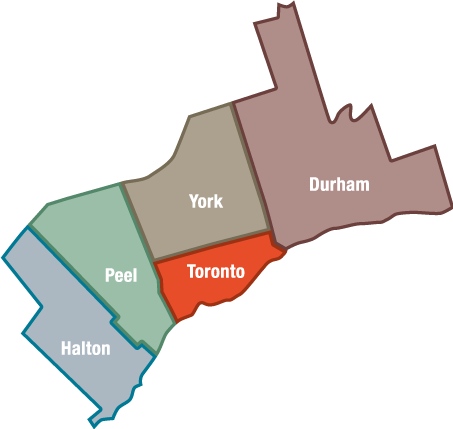 Just west of Peel Region, the region of Halton consists of towns such as Halton Hills, Milton, Oakville and Burlington.